Celldomolk (Hungary) – Déjà vu Panzio (£66 for a twin room for two nights) – 10 minute walk from Celldomolk station, above a pizza restaurant that was bustling with people. One member of staff spoke a little English. As we were out early we managed to negotiate some sandwiches to take with us for breakfast, which were presented to us after we’d finished our pizzas. The food was cheap, the area quiet, the room clean and spacious and the staff helpful and accommodating and the place was a steal at £66 for two nights. 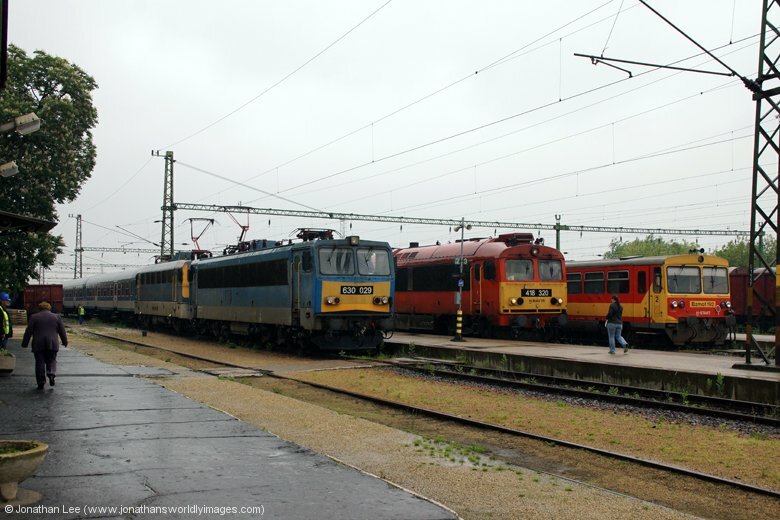 The weather hadn’t improved at all as we entered Hungary and rain persisted at Gyekenyes during the 90 minutes we had to wait for our first MAV train of the day. 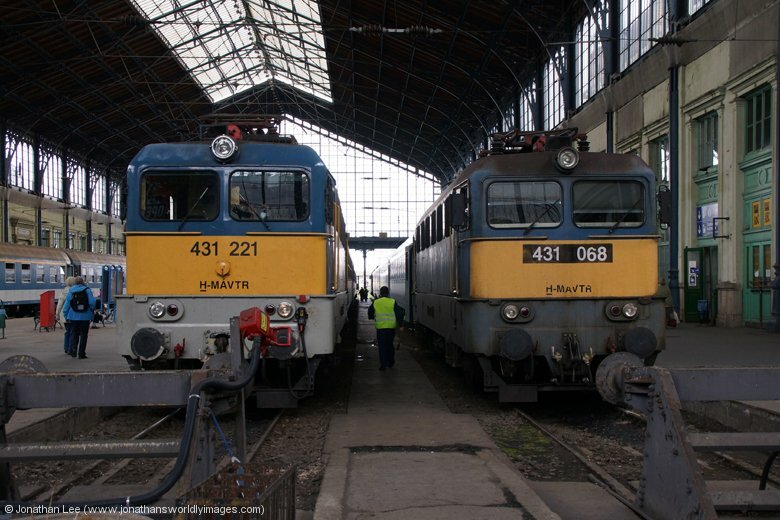 To add insult to the crappy weather the inbound of our train arrived with MAV 630029 piloting 433308, both with pan’s up. 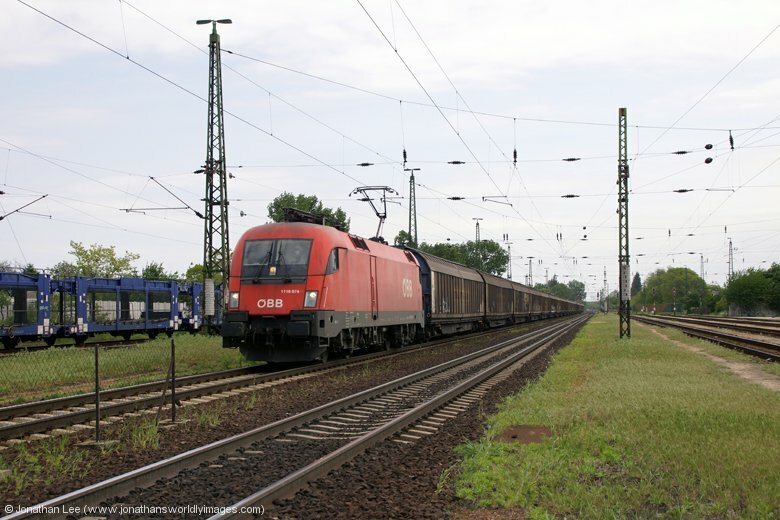 Of course 630029 was shunted off and went into the yard to work a freight and 433308 was later run round the 3 coach set to work back to Dombovar with 8215 at 1327. 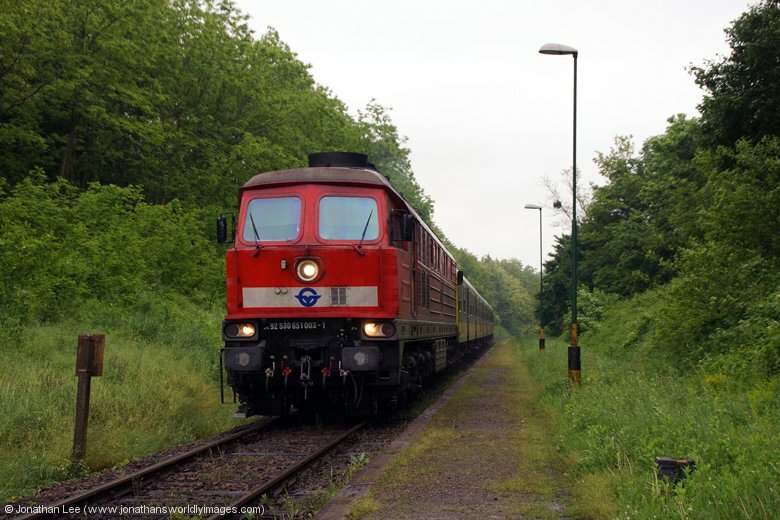 At least on board the stock it was dry and warm even if there was no freight engine on the front! 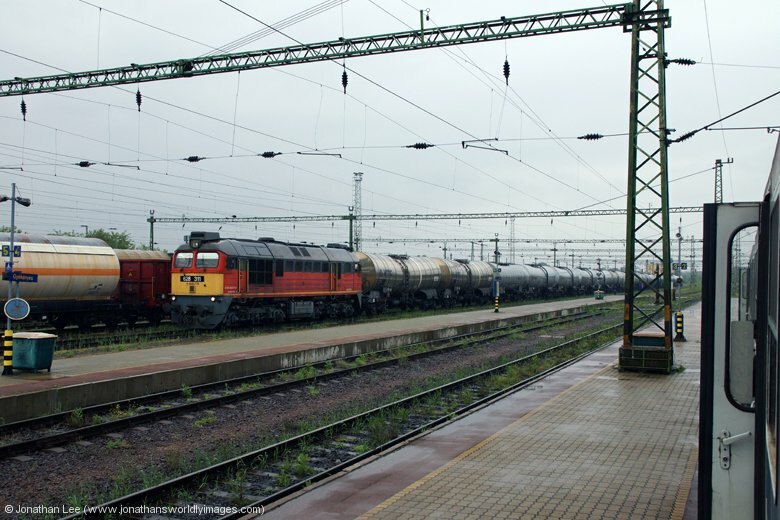 Shortly before departure M62 628311 arrived with a freight and MAV 418230 departed with 8907 1015 Pecs – Szombathely. 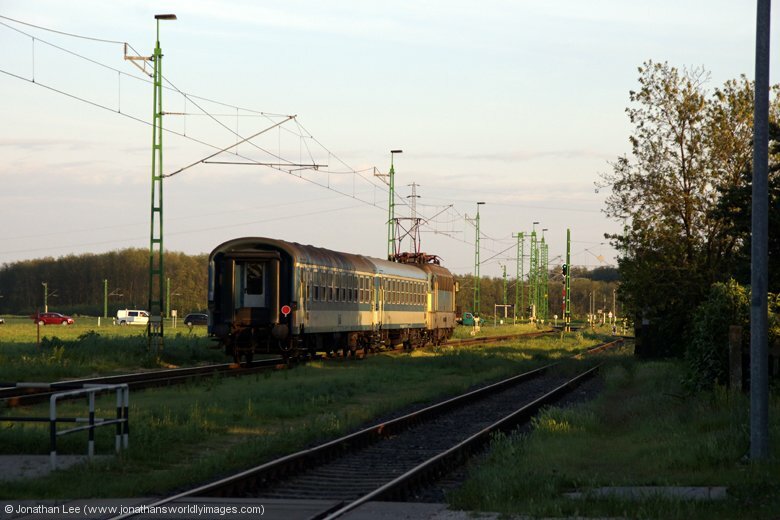 As we were deposited in the middle of nowhere by 433308 my first impressions of Hungary were that it was a country with plenty of space, the small stations seemingly serving small communities situated in the middle of fields. 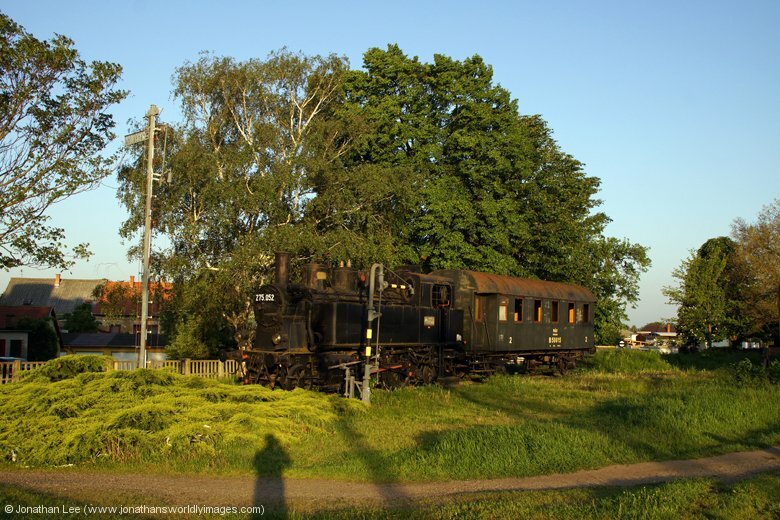 This impression didn’t change much until we arrived into Szombathely that evening. 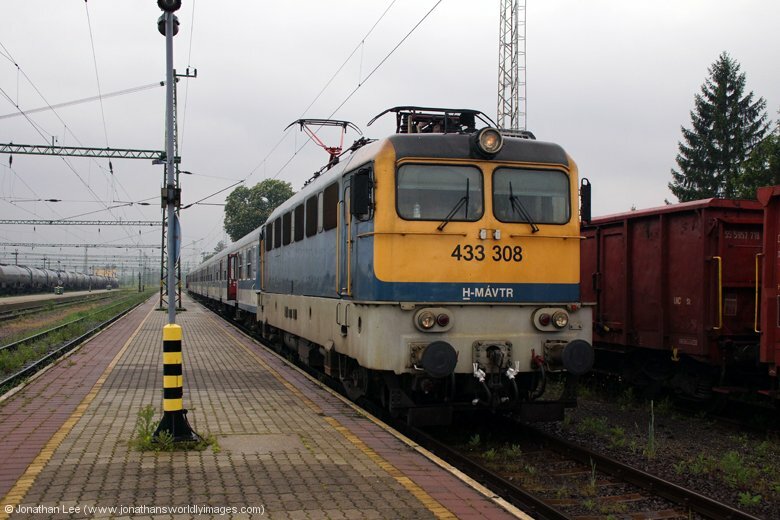 Having watched 433308 disappear off into the distance, as it left us at the single platform that formed Bolhas station, we were glad to see 433205 arriving from the opposite direction almost to time with 8234 1208 Dombovar – Nagykanizsa. We almost dropped a bullock when we chose to carry on from Gyekenyes to Murakeresztur, for our plus 8 at 4 late. 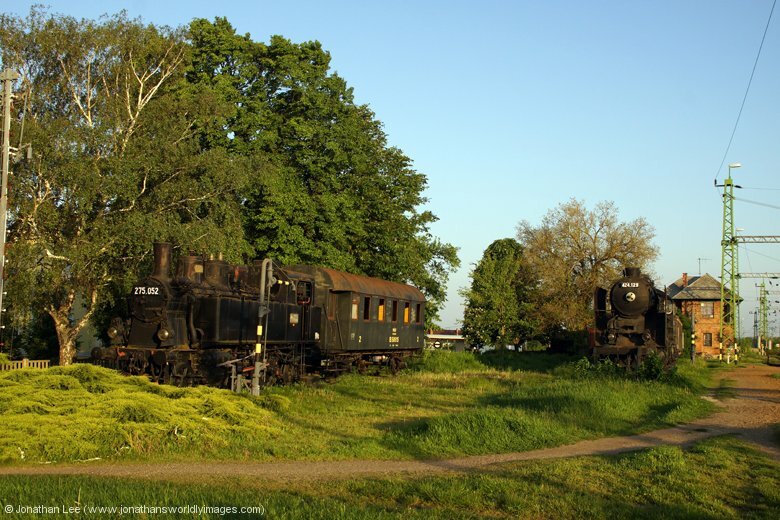 The single line into Murakeresztur opens up into two leads way outside the station which can result in trains missing. 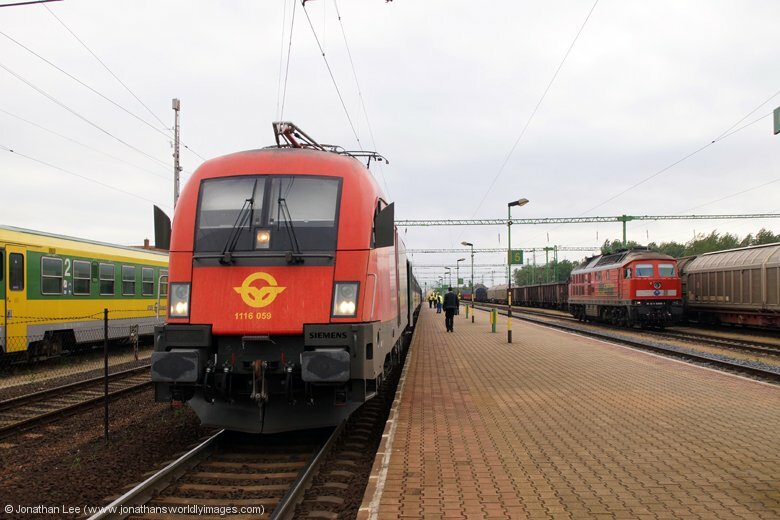 While we had a good few minutes 433209 was already sat in with 8235 1427 Nagykanizsa – Dombovar and between us and it when we arrived into the platform was 630029 with a freight. We were glad we opted to run round the front of 630029 and board straight away, without getting a photo of 630029/433209 side by side, as no sooner had we boarded did the red cap give the crew the tip to depart; 2 minutes early! 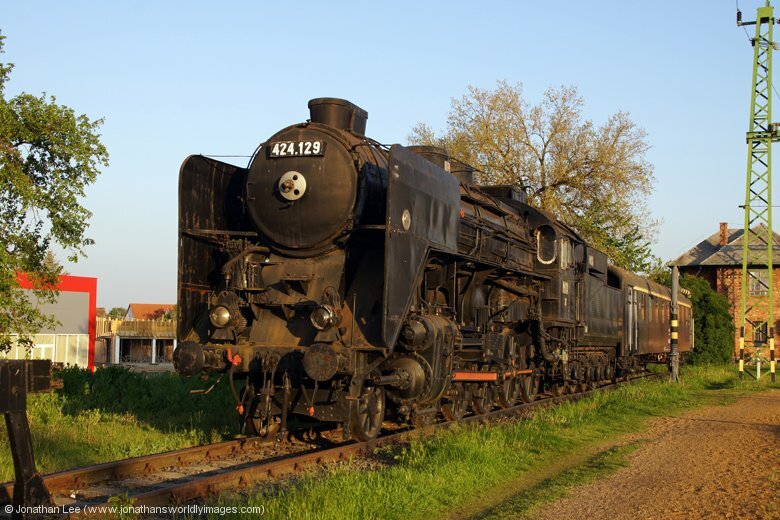 As with most people’s trips to Hungary these days our plan was to incorporate the GySev 651’s and what better way to get towards civilization than on the Pecs 651 turn? 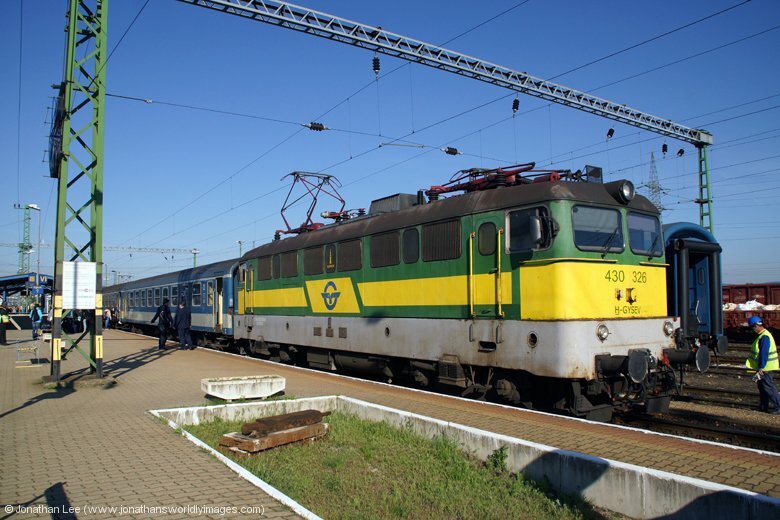 So from Gyekenyes we headed out to yet another deserted station, this time Belavar, on 8904 1308 Szombathely – Pecs with MAV 418108; my first ever rattling Ganz and nothing to write home about at all, in fact quite rubbish really. 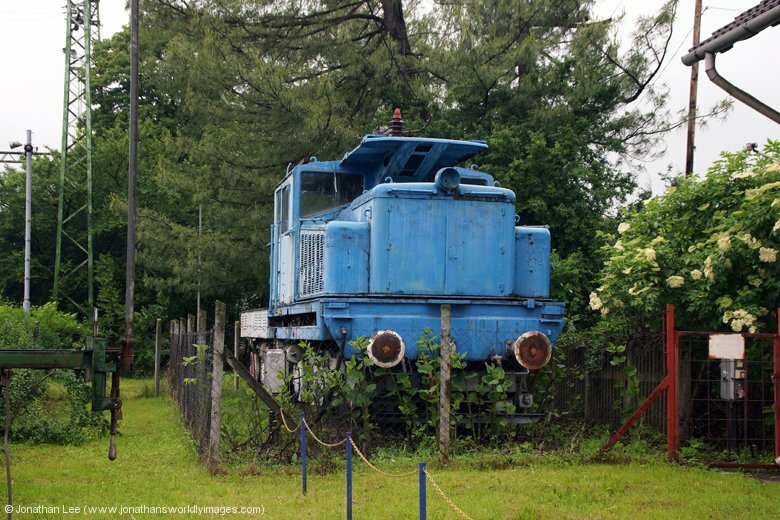 Of course what was to pick us up at Belavar would be far better; or so I thought……. 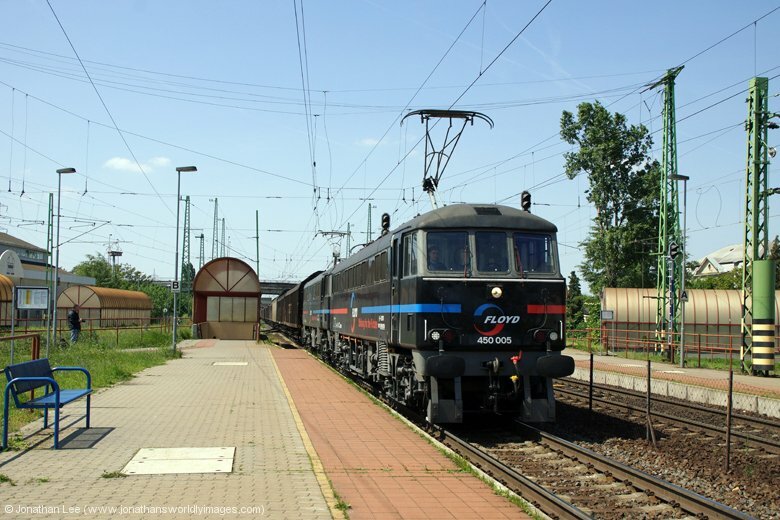 GySev 651003 arrived promptly with 8905 1415 Pecs – Sopron and the front coach was empty and red hot. 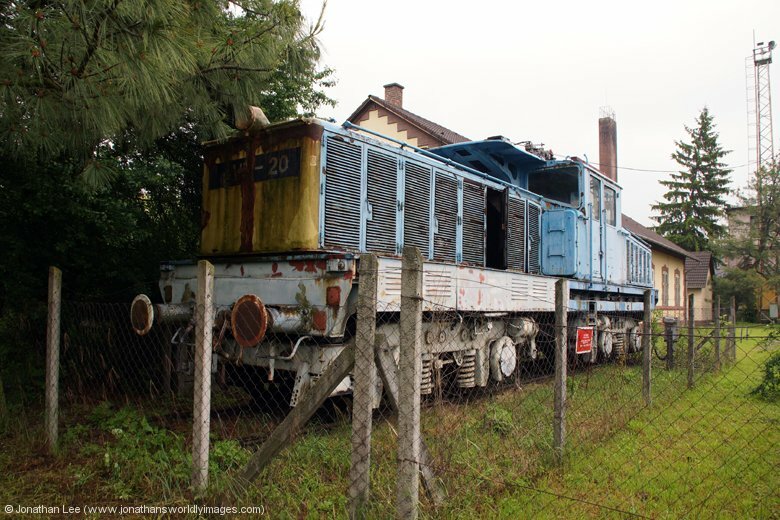 As the wind had got up the noise from the engine would be blown to one side of the train and I was poised with the window open as we departed Belavar; never before have I been so disappointed with thrash from an engine. 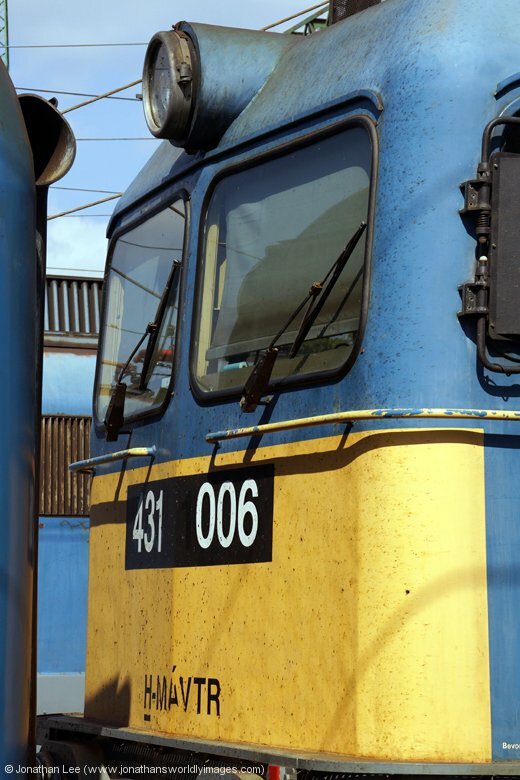 I’d heard lots of people give the 651s a good report and yet 651003 was virtually noiseless, there was no meat to it at all and the only noise I could hear was from whining fans, which isn’t thrash at all. 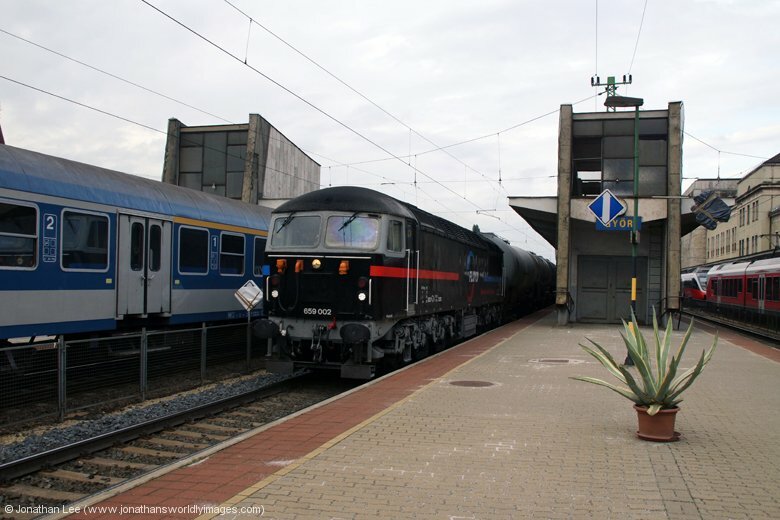 The complete lack of thrash continued all the way to Szombathely, where we were that disappointed with the lack of noise we flagged 651008 on IC911 1900 Szombathely – Budapest Keleti in favour of a walk into town to find something to eat and a move on electrics later. Our food move turned into nothing more than a 15 minute walk towards town for a 15 minute walk back, during which we found nothing open at all. We were thinking that it may have been due to it having been a Bank Holiday on the Thursday and people taking an extended weekend? As luck didn’t have it the only bakery type place on the station concourse had closed by the time we returned so the only thing we could do was have a beer in the station bar; where I realised that the stories of beer being cheaper than water in these parts of the world were actually true! At least we were given a bit of entertainment by some drunk who didn’t want to leave the station while we sat drinking our beer. Thankfully we eventually managed to find a small shop tucked away in a corner of the station, which had sandwiches for sale, so we didn’t starve that evening. 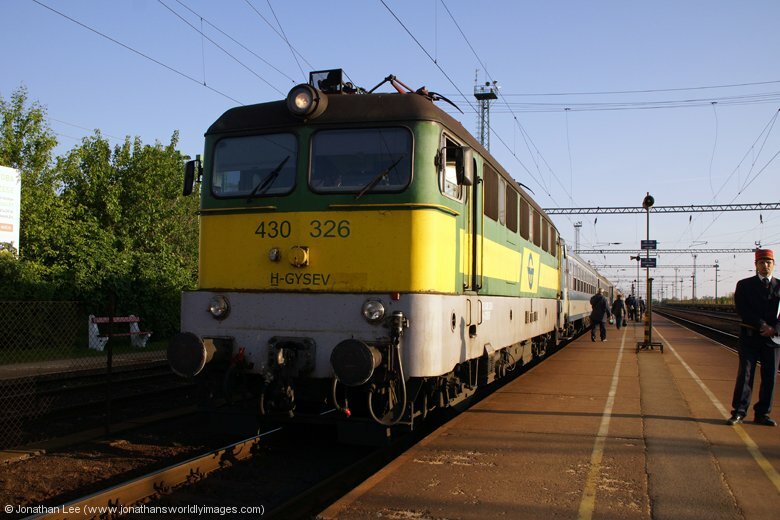 Fester over we departed Szombathely on a very empty 9021 2005 Szombathely – Veszprem with GySev 430321 in GySev’s distinct yellow/green livery. 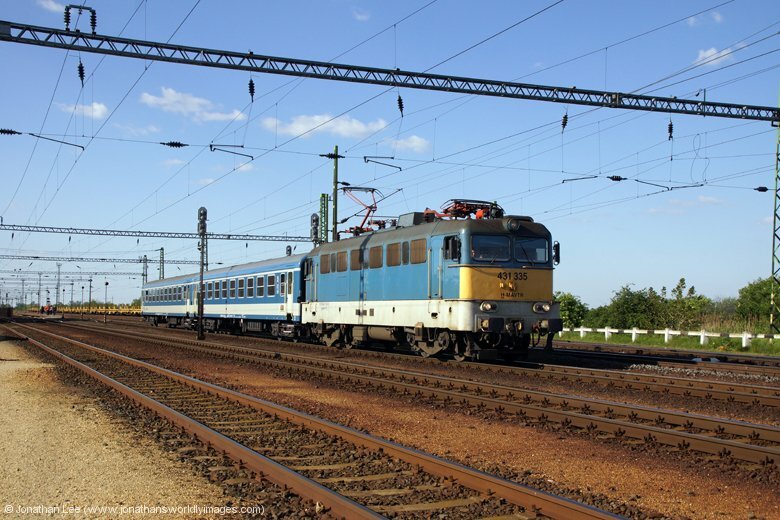 We only did it to Porpac as a fill-in move for GySev 430327 back into Szombathely on 9206 1638 Budapest Keleti – Szombathely; the main event for the evening, and the sole reason for staying out a bit late, was 9041 2117 Szombathely – Celldomolk. 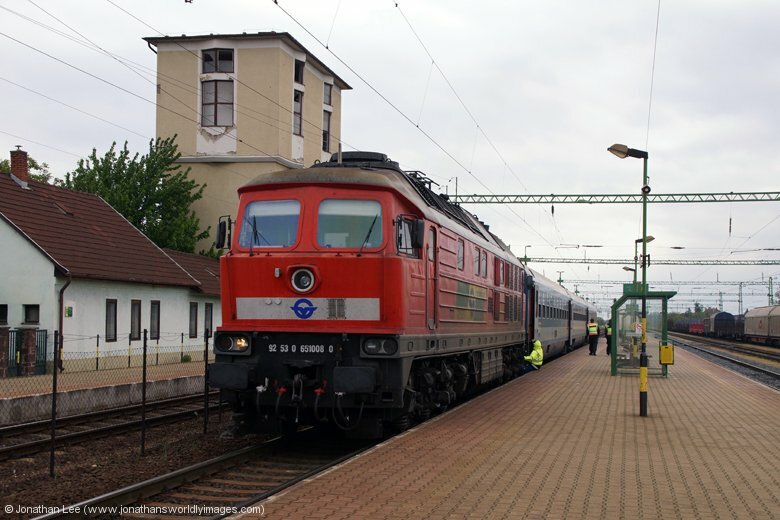 On a Saturday it was booked a freight MAV 630 and we weren’t to be disappointed when we found 630027 already sat on the train waiting to depart when we arrived back into Szombathely. 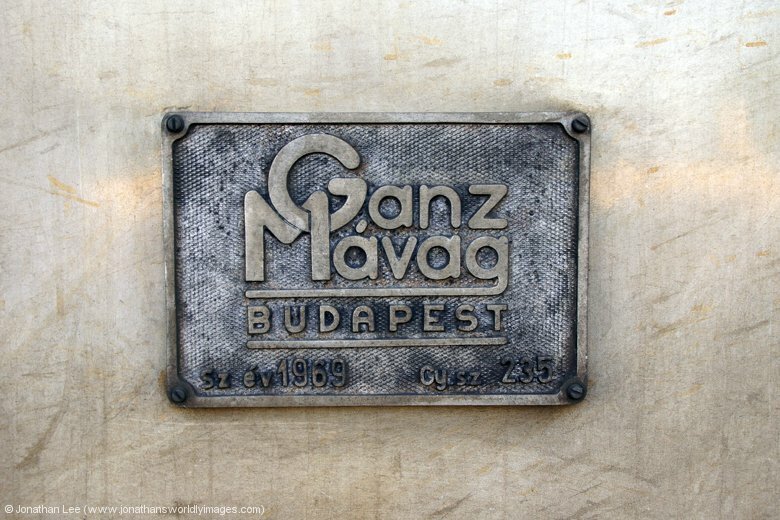 Covering the MAV 630 turn had ultimately resulted in us deciding to stay in Celldomolk rather than Szombathely for two nights and upon arrival in Celldomolk, map in hand, it took about 10 minutes to walk to the Déjà vu Panzio. The wind had got up during the day and it wasn’t the nicest of walks but at least it hadn’t started to rain! Everything we walked past in Celldomolk was closed, other than bars, as you might expect at 2200 on a Saturday night maybe? We were so glad to find that our lodging for the night was actually above a pizza restaurant that was bustling with people. One member of staff spoke a little English and we were soon checked in and shown to our room. As we were out early we managed to negotiate some sandwiches to take with us for breakfast, which were presented to us after we’d finished our pizzas. The food was cheap, the area quiet, the room clean and spacious and the staff helpful and accommodating and the place was a steal at £66 for two nights. Sleep wasn’t hard to come by that night……. 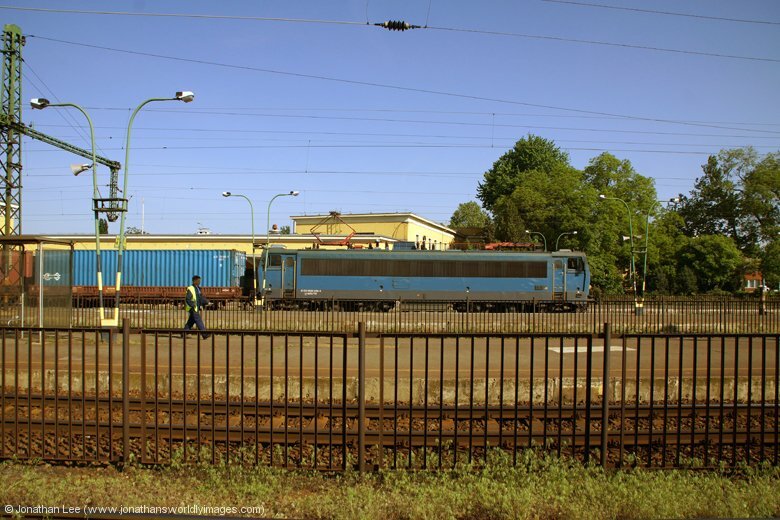 We were up for the 0608 from Celldomolk to Gyor, the walk to the station not being dissimilar to the one in the opposite direction the previous night; the wind not having died down at all. 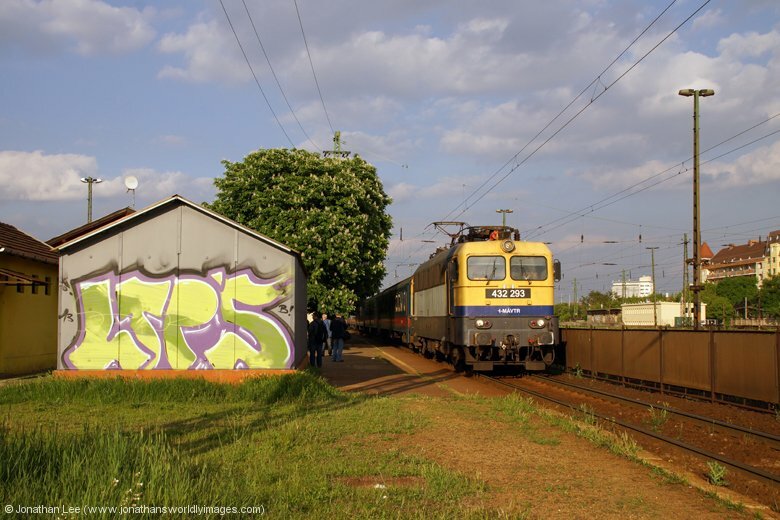 Even though we’d completely dissed 651008 the previous night we’d planned to do a move on the GySev turns on the IC’s ex Gyor. 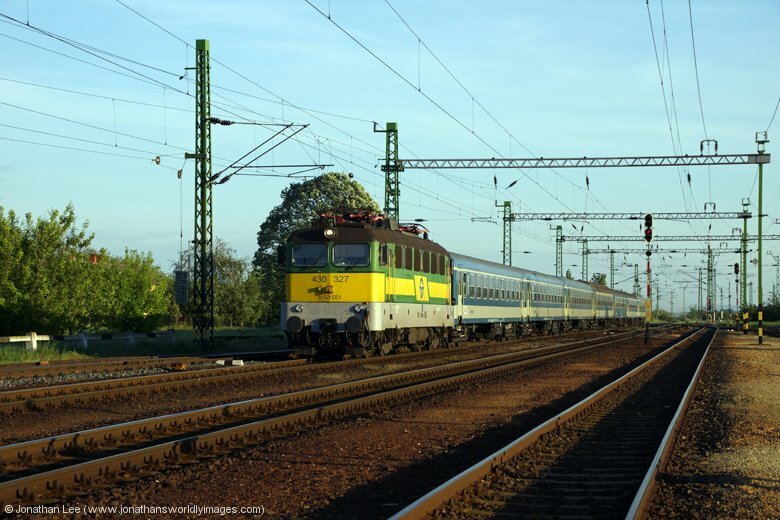 Having replaced GySev 430327 on 9209 0522 Szombathely – Budapest Keleti MAV 418318 set us off in the right direction; rattling its way to Gyor. 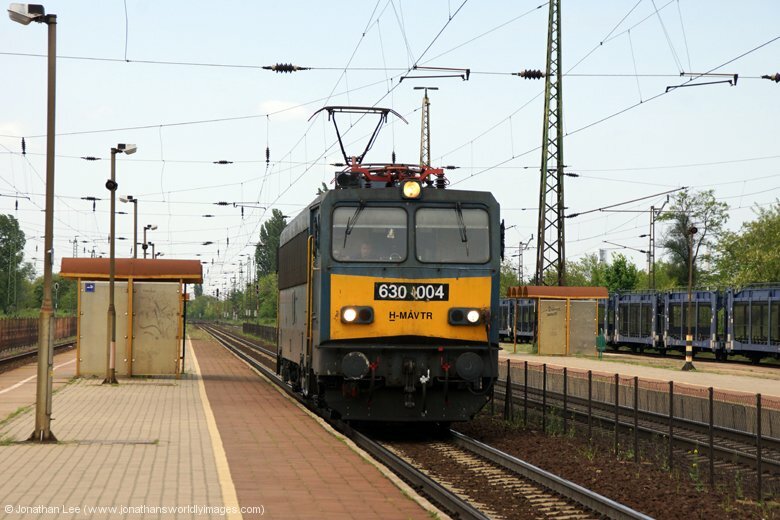 We didn’t have long at Gyor but were treated to a passing Floyd Class 56 while we waited, 659002 (56115). The problem was that the 56 shouldn’t have been passing at all! 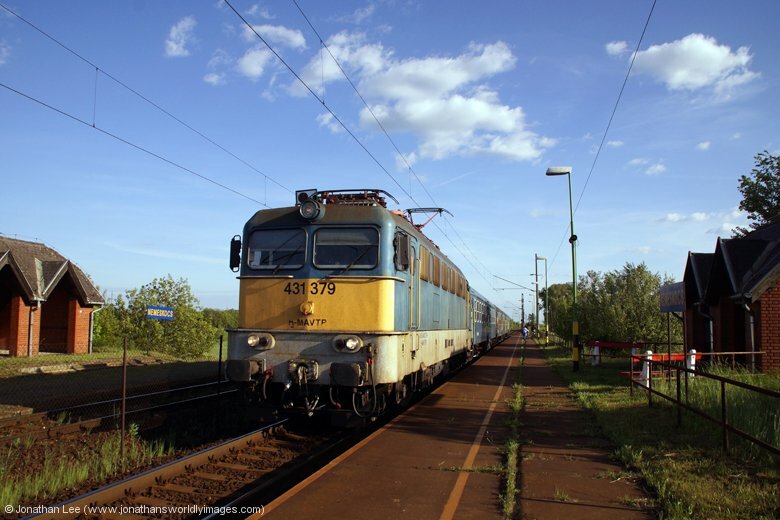 I’d noticed it approaching in the distance and also noticed the red signal at the end of the platform that it had so figured I’d got plenty of time to get outside of the station canopy and into the sunlight for a photo while it was slowing down. Wrong! While I was faffing to get my camera out Aidy commented on the fact that it was moving a bit, not having actually realised it had a red at the platform end himself, I turned round to find it almost on top of me, snapped the shot and moments later 659002 was sailing past the red at the platform end, brakes screeching away, hard on! It wasn’t just a run of the mill SPAD (signal passed at danger) it was a good one, the loco and the first half of the train were past it, a good 200m I’d say. During the braking we noticed a window open in the offices above the station, from which a woman appeared and looked on in disbelief and just stood there shaking her head until the train stopped then disappeared back inside again; I was guessing there was a driver on 659002 that wasn’t in the best of places at that time and was bracing himself for a good dressing down. 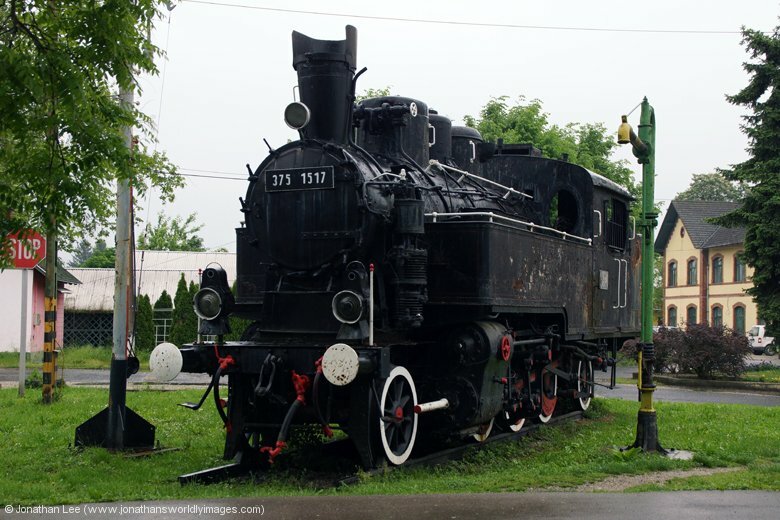 From where we were stood it looked like his train was only about 100m from the crossover points outside the station; from where GySev 1116059 appeared shortly after he’d stopped with our train to Repcelak so we didn’t get to see the aftermath unfortunately. 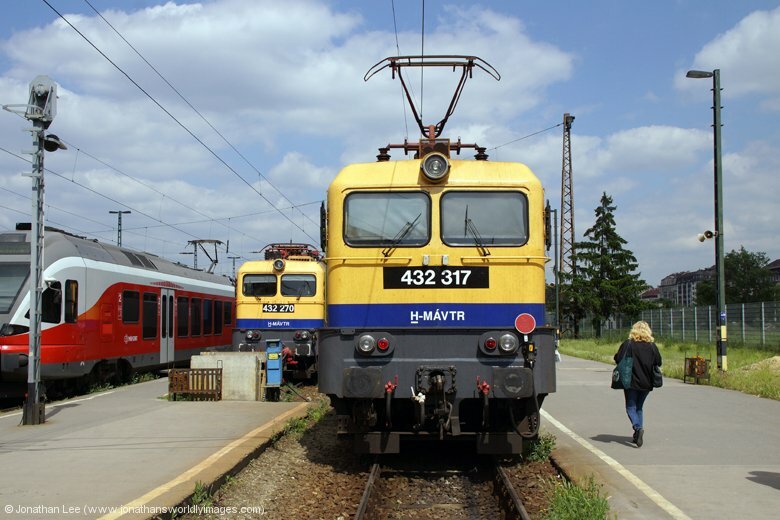 IC trains in Hungary require a compulsory reservation and ours from Gyor to Repcelak cost HUF450 each. We bought our return ones at the same time, costing the same. 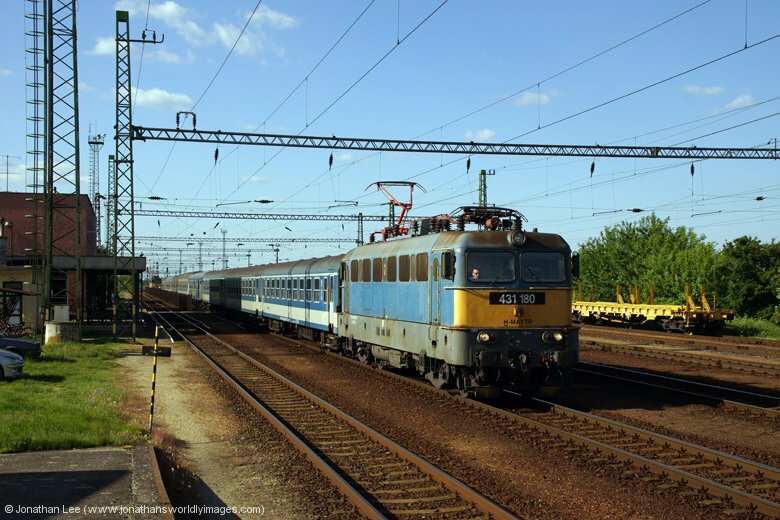 We were hoping that the disappointing 651003, from the previous evening, wouldn’t produce at Csorna to work IC910 0610 Budapest Keleti – Szombathely forward and we weren’t disappointed in those stakes as 651008 was sat waiting to drop on the moment 1116059 was removed. 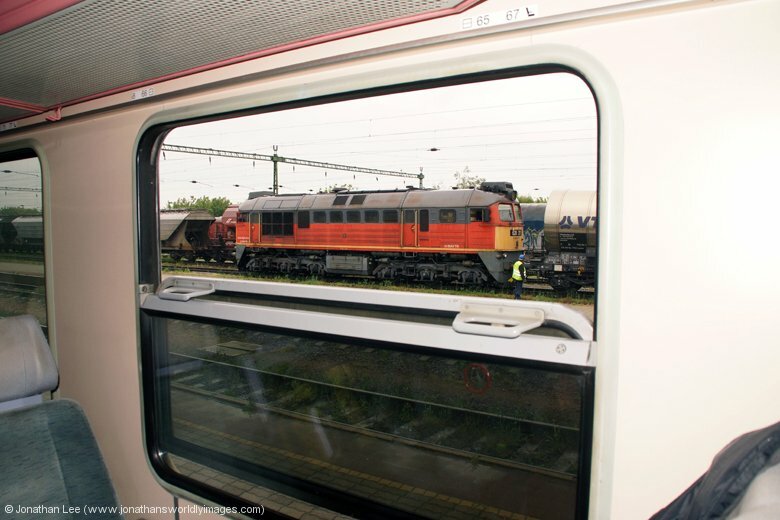 However bellowing out of the toilet window when 651008 depart soon brought back memories of the previous evening as 651008 was just as shocking. No thrash, plenty of clag, plenty of fan noise; a big, big disappointment, especially after hearing so many good things about them. Not my cup of tea at all and something that I certainly won’t be going out of my way to get in again. We had an hour fester at Repcelak which we spent working out a bash for when we got back to Gyor as we weren’t satisfied with the one we’d already planned. At least there was a drinks machine in the waiting room to provide refreshments; there was nothing else around outside the station at all. Move sorted we waited patiently on the platform, in the wind, which was becoming bearable as the sun had now come out too. 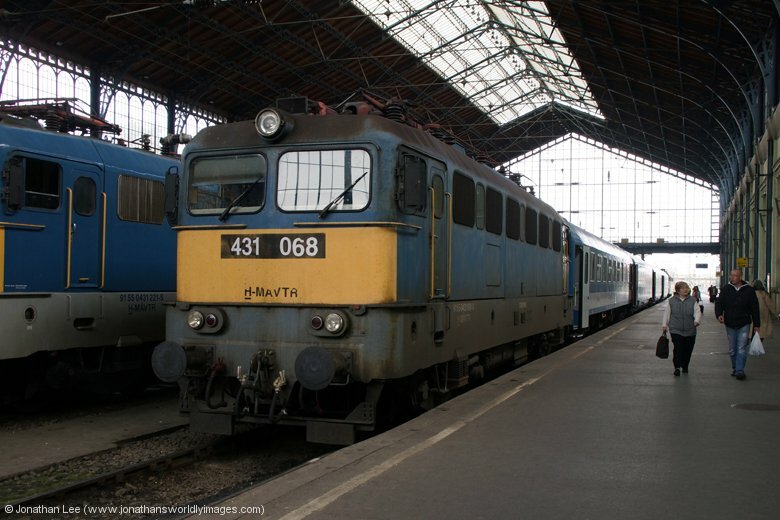 As we expected MAV 418204 came bowling in with IC917 0811 Szentgotthard – Budapest Keleti; the diagram it was working recently having transferred back to being a Szombathely 418 vice GySev 651 due to GySev having freight commitments for one of the 651s and needing 100% availability to cover all the turns! 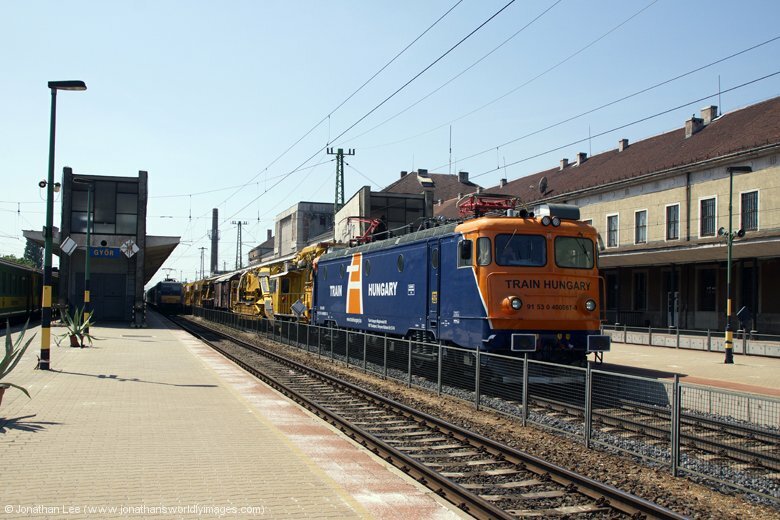 418204 gave way to MAV Traxx loco 480003 at Csorna for the run to Budapest Keleti; we got off at Gyor where we were treated to another Floyd train passing through, this time it turned out to be a pair of 86’s, 450001 with 450004 dead in train, these clearly having the road straight through the station! There was no sign of 659002 and its train so the SPAD issue had obviously been cleared up and the train sent on its way. 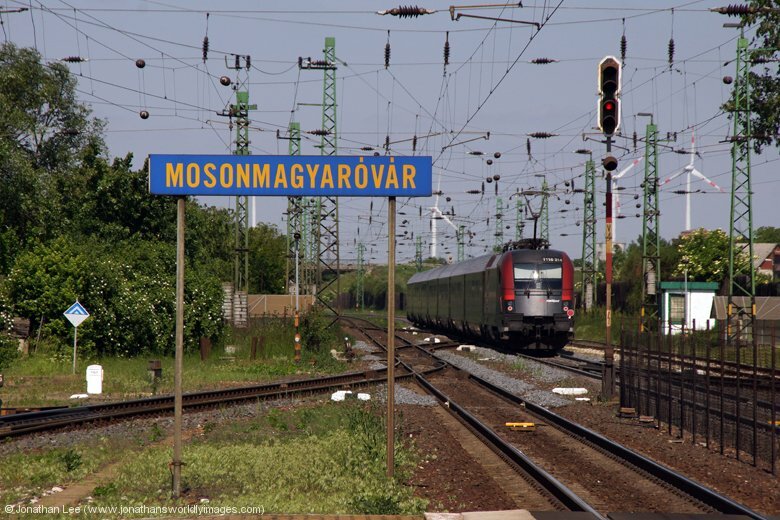 Our replanned bash for the afternoon wouldn’t have us going far really and started with a return trip on OBB Railjet trains to a mouthful of a place, by the name of Mosonmagyarovar; easy to say once you know how. It wasn’t a massive plus there as it was and we were late going out from Gyor but it made. 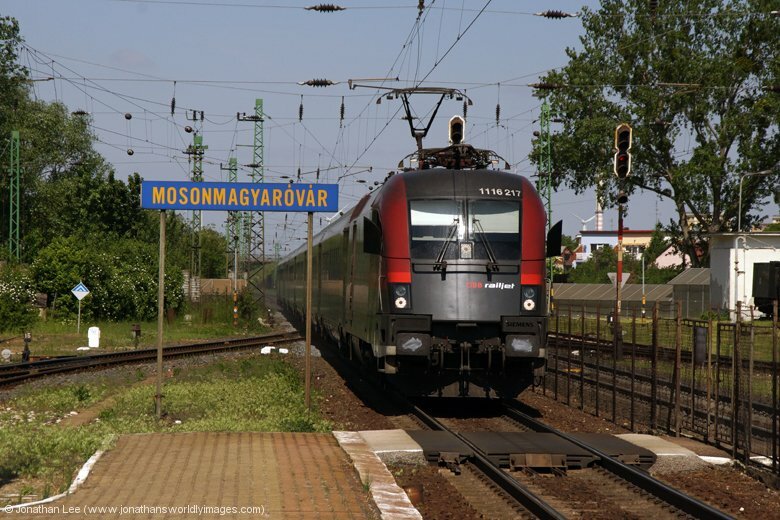 Railjet trains don’t seem to be on time at all in the Gyor area and evidence of why became clear as we waited for people to walk down the platforms at Mosonmagyarovar to get into their booked coach. We were then further delayed as some guy dropped one of his bags between the train and platform edge; he didn’t even hesitate to get down onto the tracks and pick it back up and then return further up the platform to collect more bags. Bizarrely though the guard and security guard on the station seemed to think it had been either Me or Aidy that had gone down onto the tracks, or it certainly seemed that way when they boarded the train at our door and demanded our tickets. The language barrier didn’t help but once we’d departed the guard did actually apologise to us, we assumed having realised he’d picked on the wrong people? That Railjet escapade soon put pay to our plans that involved a second round trip to Mosonmagyarovar before we headed back towards Celldomolk that afternoon. 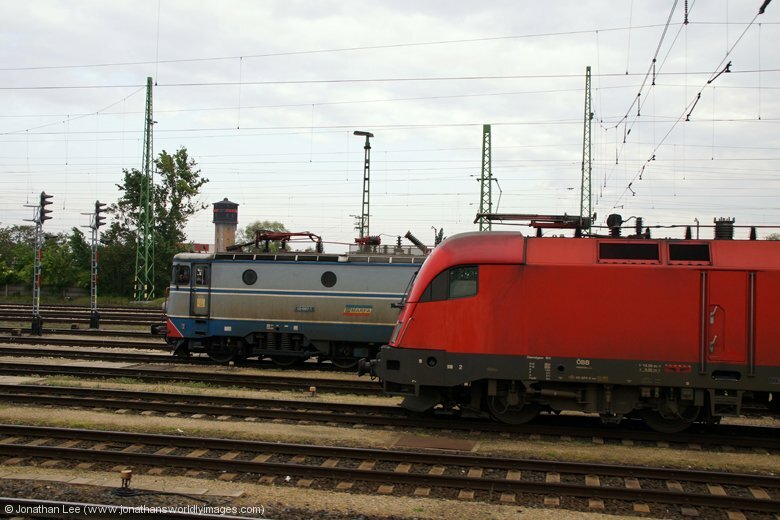 Our next fag packet plan move then became dud GySev 1116059 out to Acs for GySev 1116065 back to Gyor Gyarvaros on 9202 1038 Budapest Keleti – Szombathely where we spotted our third Floyd train of the day, another pair of 86’s this time 450005/004 in multi. From this point on our move went downhill and ultimately resulted in us returning towards Celldomolk a lot earlier than we’d planned. 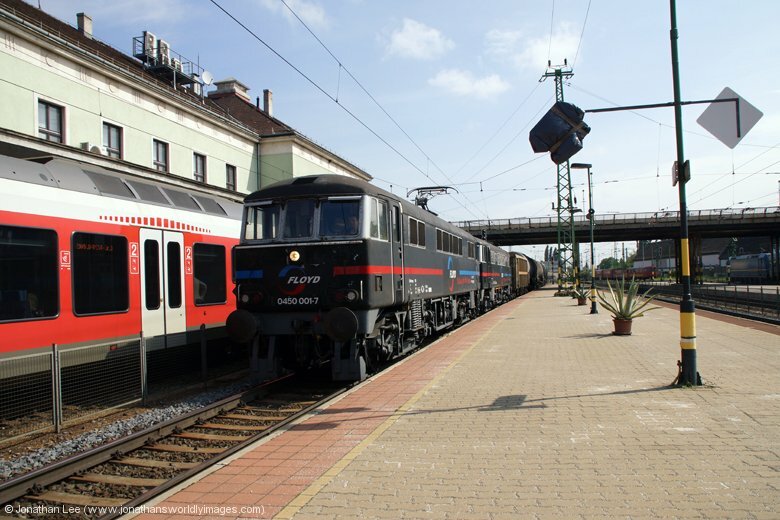 Having done 418316 into Gyor on 9215 1124 Celddomolk – Gyor we soon realised that we should have waited at Gyor Gyarvaros for 418156 on 39515 1100 Veszprem – Gyor, which arrived shortly after we did; by which time we’d discovered the 1328 Gyor – Budapest to be a nice shiny new pair of Flirt EMUs! 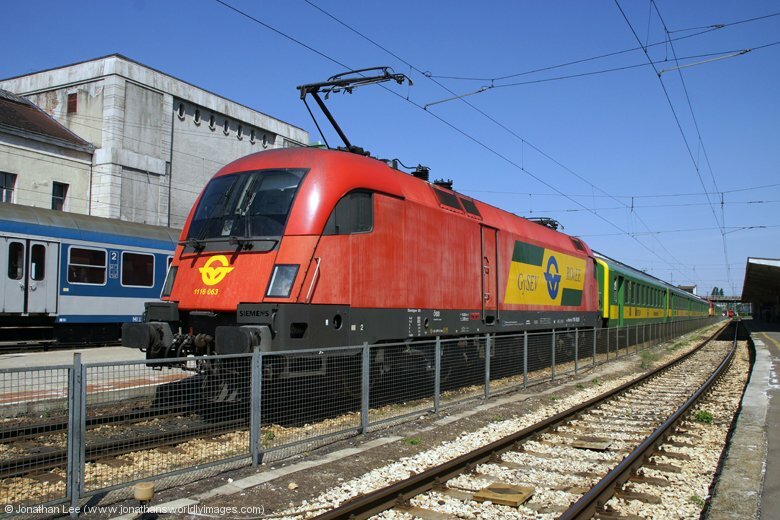 We’d seen 418156 at Gyor that morning and hadn’t been able to figure out what it had been on at the time, we then worked out it had been 39512 0724 Gyor – Veszprem; whether booked hauled or not I don’t know as it’s not listed in any diagram I could find? The Flirt’s put pay to us doing any further moves ex Gyor and we spent the hour we had to fester working a rather nice bash out around Boba that would redeem the afternoon/evening. 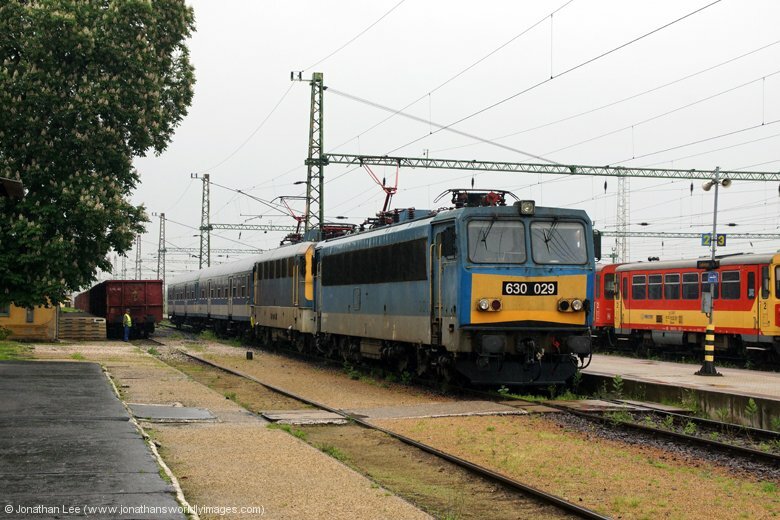 Meanwhile 418316 shunted its stock out and then brought it back in, still on the Gyor end of the train. 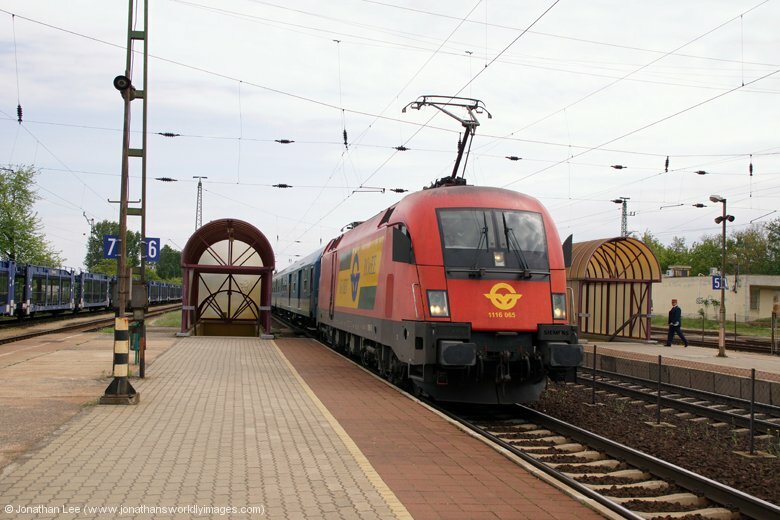 MAV Traxx 480015, which we’d assume would work the 1328 to Budapest, was confirmed by the driver as being booked to work 9303 1428 Gyor – Budapest Deli instead. 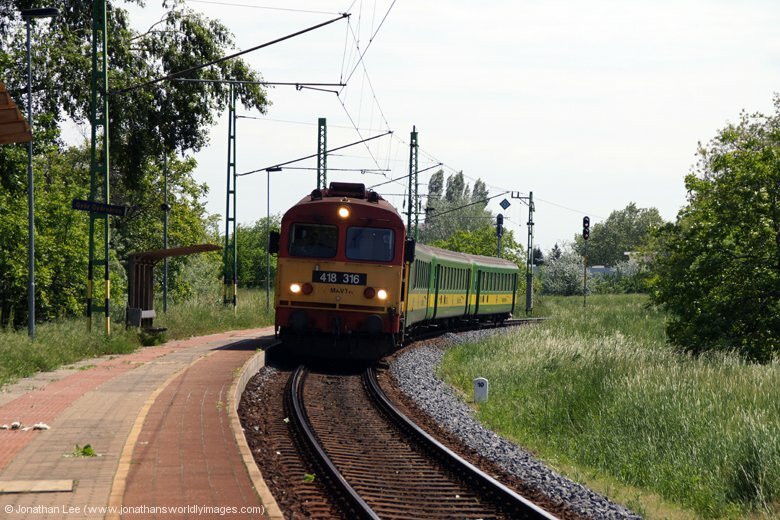 We did this to Gyor Gyarvaros and then boarded 9234 1456 Gyor – Celldomolk there, not actually realizing until halfway through the trip to Celldomolk that 418316 was on the rear of the train, which 418308 led, both powering all the way. 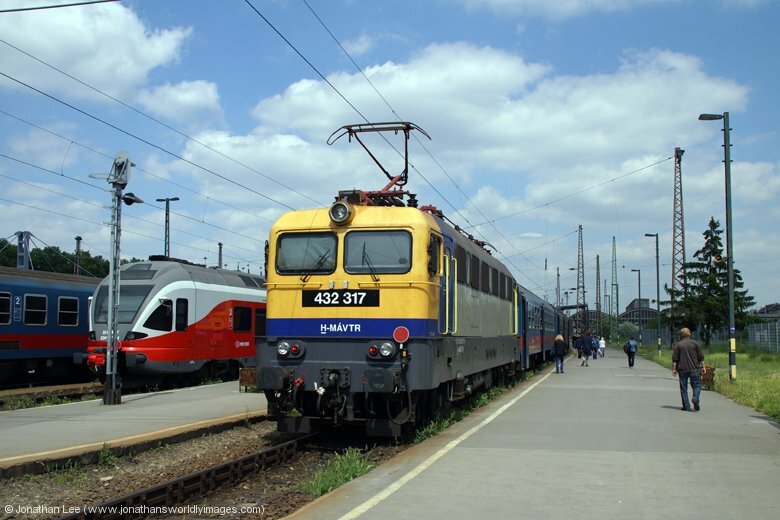 Had we checked the diagrams more thoroughly we’d have figured out that the train was booked T&T; hence the reason we should have flagged 418316 going into Gyor in favour of 418156 coming in from Veszprem. 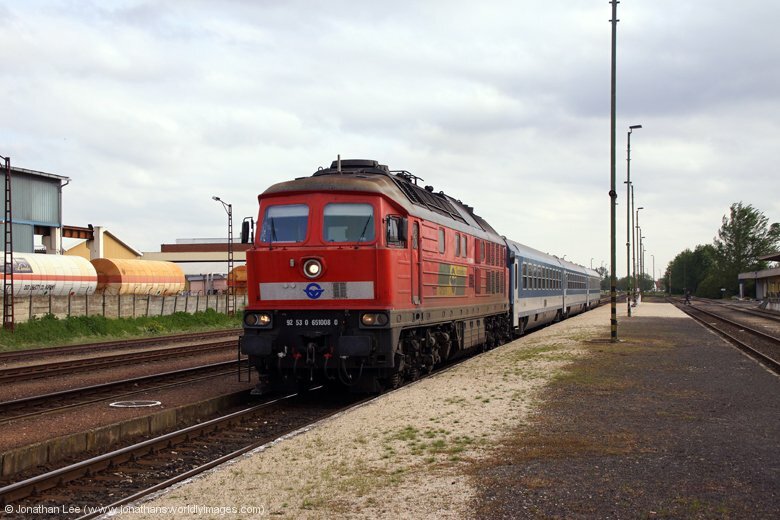 Our relaxing afternoon jaunt back to Celldomolk was going swimmingly until we got to Vinar and waited for 15 minutes for a late running 9203 1507 Szombathely – Budapest Keleti to run through. 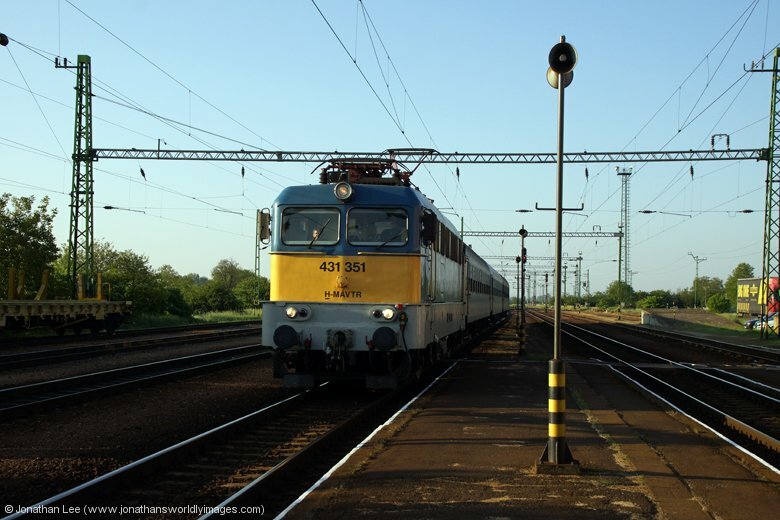 This put our third reworked plan into disarray for the afternoon, us being on a plus 8 at Celldomolk for 903 1607 Szombathely – Budapest Deli to Boba, yet as we rounded the curve into Celldomolk we spotted MAV 431180 sat in, seemingly waiting to depart with a train towards Boba. As we were crossing its path it couldn’t do so until we got to the platform end. 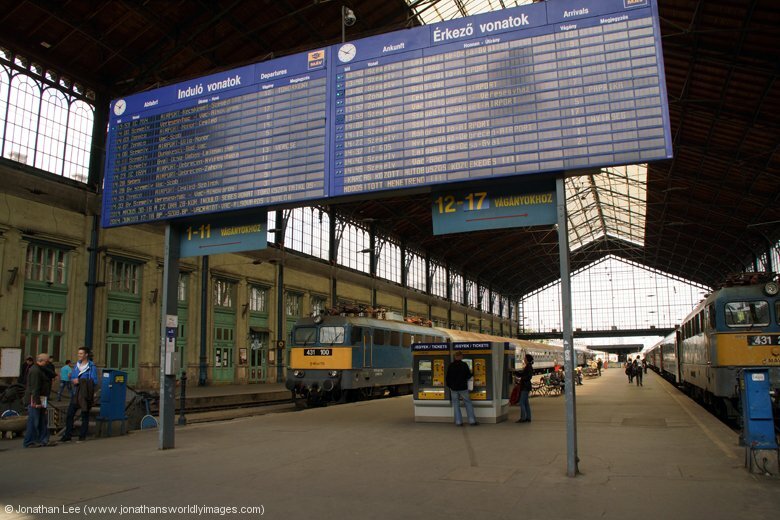 The destination boards in the stock confirmed it was a train bound for Budapest Deli and thankfully it was a cross platform leap and we made it with ease. 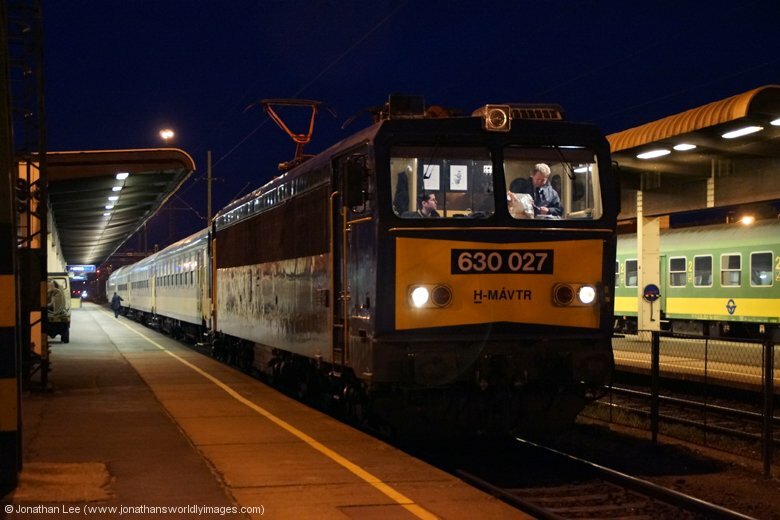 From that point on our evening went smoothly enough, involving no less than 9 MAV 431’s and a MAV 418, with us arriving back into Celldomolk off 908 1830 Budapest Deli – Szombathely at 2113. Spending even 15 minutes at Boba, nothing more than a junction station in the middle of nowhere, is fascinating enough just to watch the stock shunts that occur every hour. 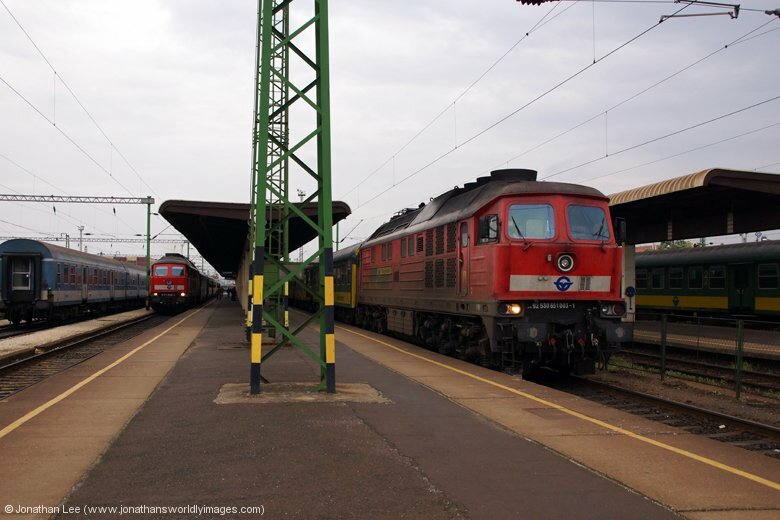 One set comes in on a Zalaegerszeg – Boba and is then shunted to the rear of the Budapest Deli bound train. 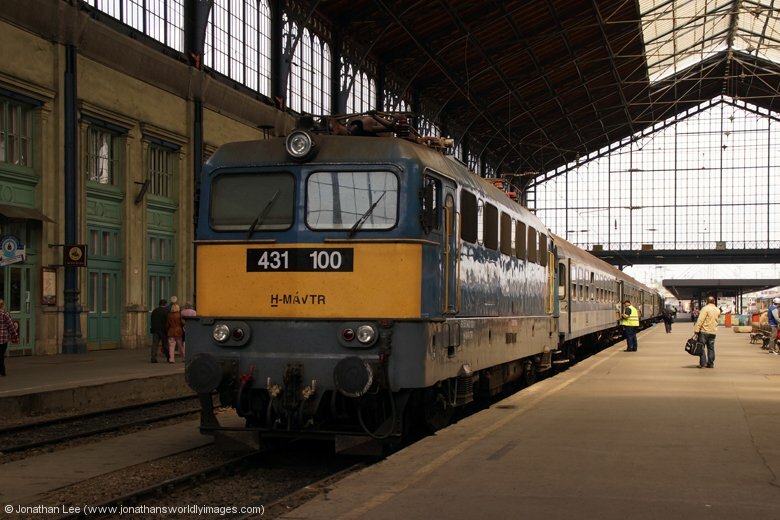 A train then arrives from Budapest Deli and detaches a couple of coaches from the rear these then form the next Boba – Zalaegerszeg train with the same loco that came in from Zalaegerszeg; all done very efficiently even if the trains weren’t on time at all, all seemed to be about 5-10 late departing Boba. 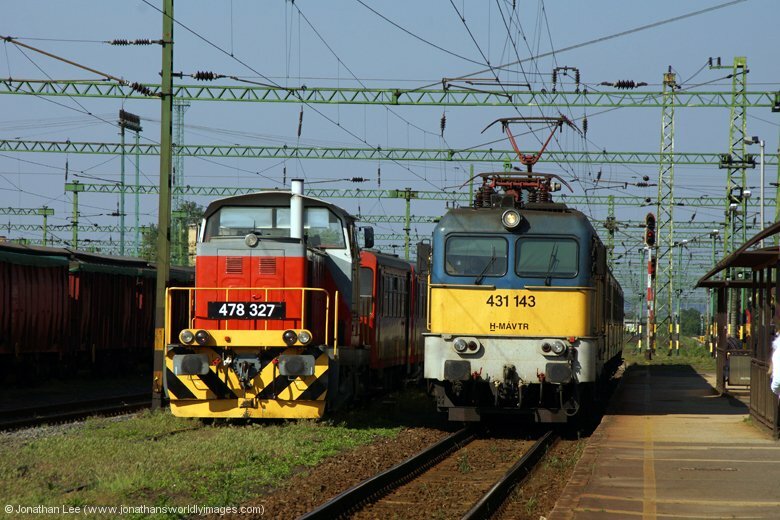 The only issues we had that evening we when we were festering at Nemeskocs for 9523 1646 Zalaegerszeg – Celldomolk, which turned up a good 25 late with 431284 and 431145 dead in train. 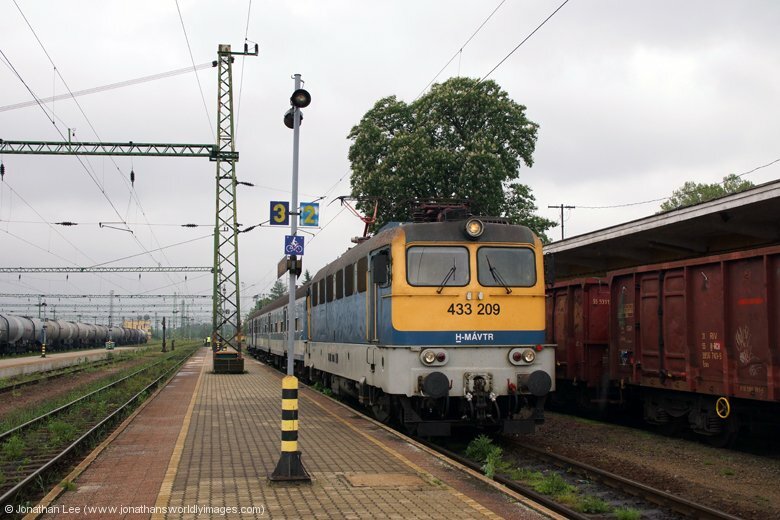 While we did have alternatives at that point we still opted to do 431284 to Celldomolk where we were pleasantly surprised to have not passed either 9526 1806 Celldomolk – Zalaegerszeg or 9023 1812 Celldomolk – Veszprem. 9023 was sat in the adjacent platform as we arrived with 431351 and the stock we arrived on actually formed 9526 with 431107 backing straight down from the head-shunt as we came to a stand. We couldn’t get from the guard of 9023 which train was going to depart first so we stood on the platform and the moment the road came off for 9023 first we clambered aboard and got off at Nemeskocs to wait for 431107 behind on 9526; much to the confusion of the guard! 431107 with 9526 wasn’t far behind so we didn’t have to wait long. Before we departed Boba on 956 1909 Boba – Zalaegerszeg with 431179, 431284 turned up light from Celldomolk which gave us an extra bonus after we went to Janoshaza and back into Celldomolk with 431335 on 9511 1846 Zalaegerszeg – Celldomolk, in that 431145 that was dead in train last time we’d gone into Celldomolk then dropped onto the set to work 9518 2006 Celldomolk – Zalaegerszeg; as per diagram. 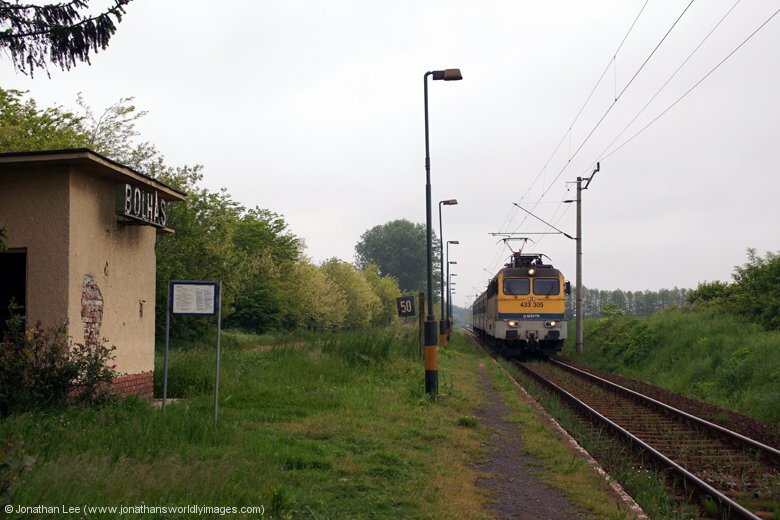 Our wait at Nemeskeresztur was a bleak one, it was still windy, there was nobody else about at all and not a building in sight! 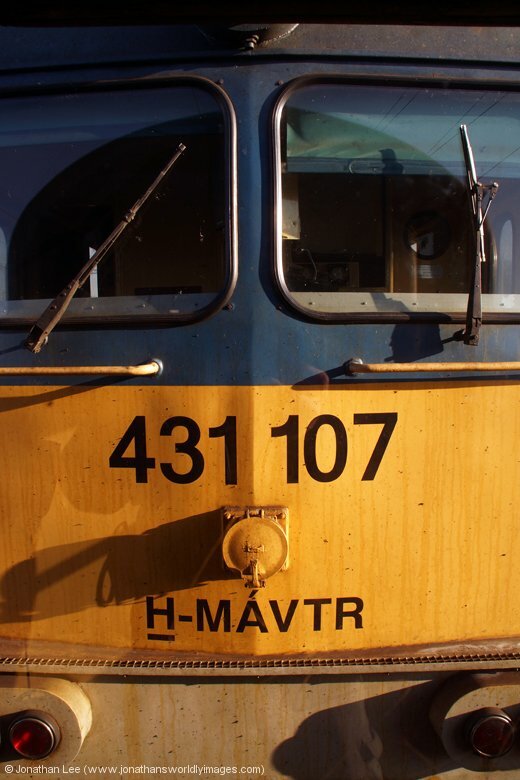 Thankfully MAV 418310 turned 10 late, having been announced so. Luckily 908 1830 Budapest Deli – Szombathely was also a little late and we made it at Boba. 431362 delivering us back to Celldomolk, topping off a very enjoyable evening in the Boba area. While the Déjà vu Panzio wasn’t as full as it had been on the Saturday night it was still open for food and a pizza & beer were a very welcome sight! As we were checking out early the following morning the bill was paid while we waited for our food and sandwiches were again produced in lieu of us missing breakfast again the following morning. Having done our Boba bash the previous evening we’d worked out that the locos on our planned early start would in theory all be ones we’d had the previous night so we had a lay-in for a later than planned start at 0645 from Celldomolk! Thankfully the wind had died down and even more thankfully shops, namely bakeries, were open as we walked to the station, which allowed us a more savory breakfast than sandwiches. All the shops at the station were also open for hot drinks so the morning was good. 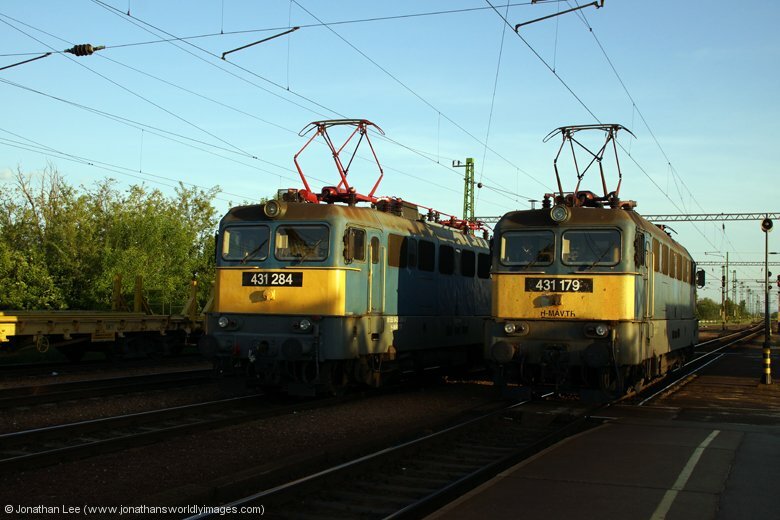 We planned to do 4527 0846 Szekesfehervar – Budapest Deli but it was immediately evident that we’d been bowled for that when we found a pair of shiny new Flirt EMUs in the platform waiting to depart with said train; bowled again, and it wouldn’t be the last time during the day’s bash either! 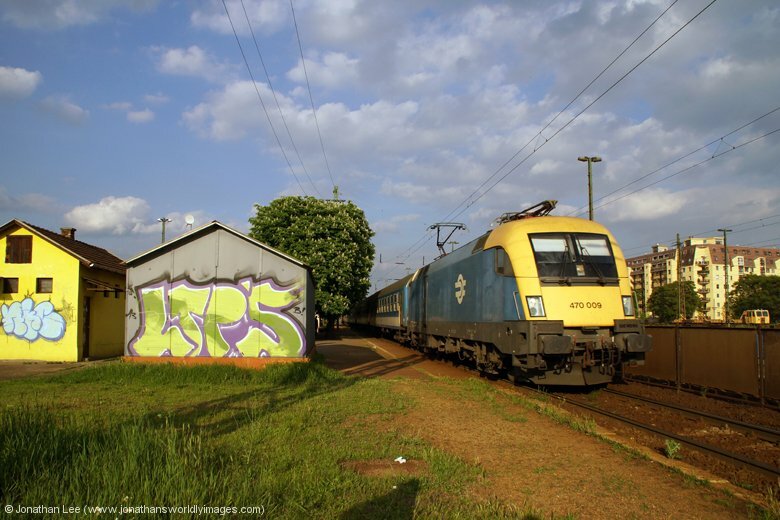 All we could do was wait for 9067 0830 Veszprem – Budapest Deli behind and hope it wasn’t an EMU. 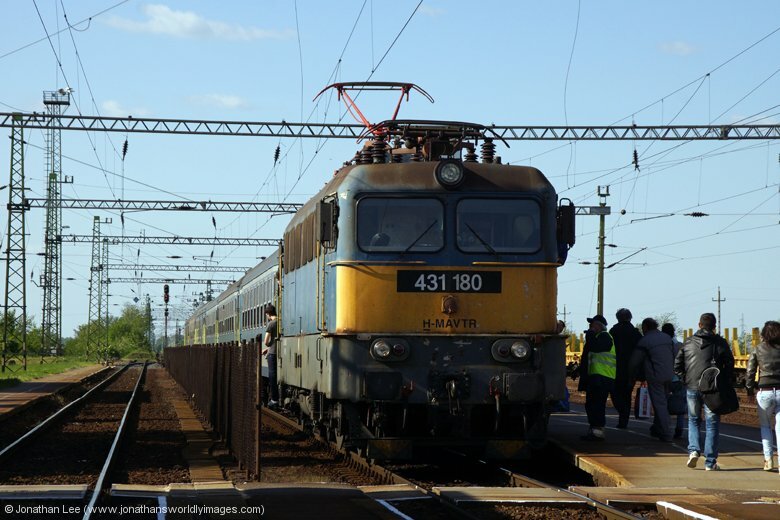 Thankfully it wasn’t and we did 431143 to Kelenfold for an EMU round to Kobanya Kispest. 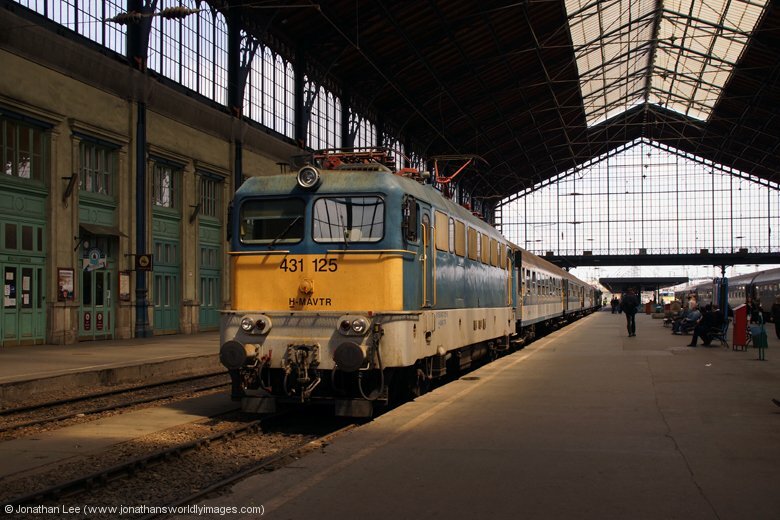 There was engineering works hindering train movements in/out of Budapest Keleti so we decided not to even get involved in any form of Kelenfold leaps and headed straight for moves ex Budapest Nyugati. 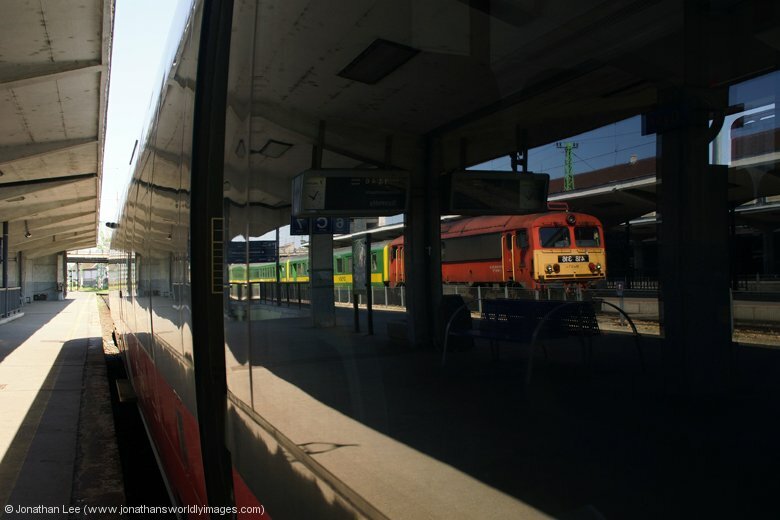 We got off to a great start at Kobanya Kispest and with a hand written simplifier of the loco-hauled trains between Kobanya Kispest & Budapest Nyugati we had more of a problem trying to keep on top of the move writing than actually finding trains to do. 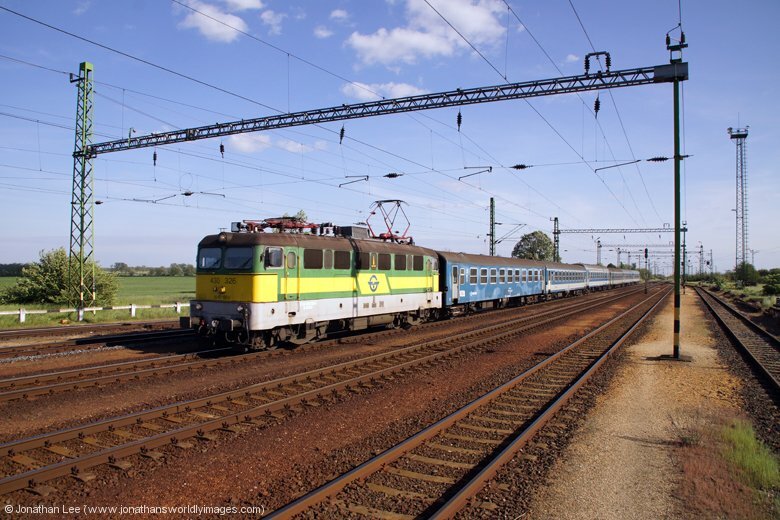 Unfortunately some of the locals on the Nyugati – Cegled/Monor services produced Flirt EMU’s. 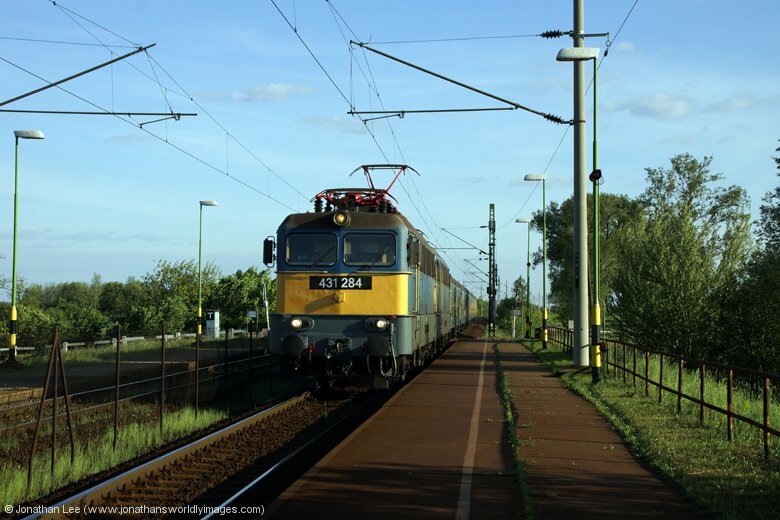 There was actually a notice on the hauled stock about Flirt EMUs, we were guessing it was announcing that they would be entering service, which they obviously had. Unfortunately what went out to both Cegled & Monor didn’t always come back on what you’d expect it to and this caught us out a couple of times. Still there were enough trains to go at and there was always something else along shortly afterwards. 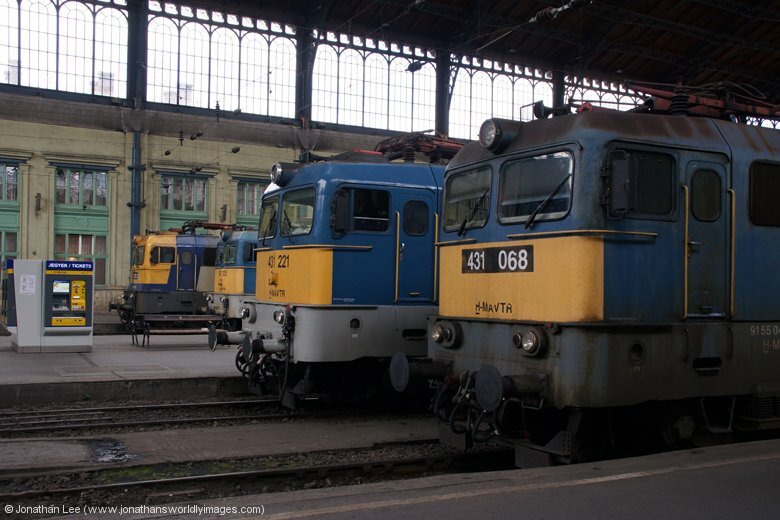 Budapest Nyugati train shed platforms are something else; it was like stepping back into the 1970’s when we first got off there. 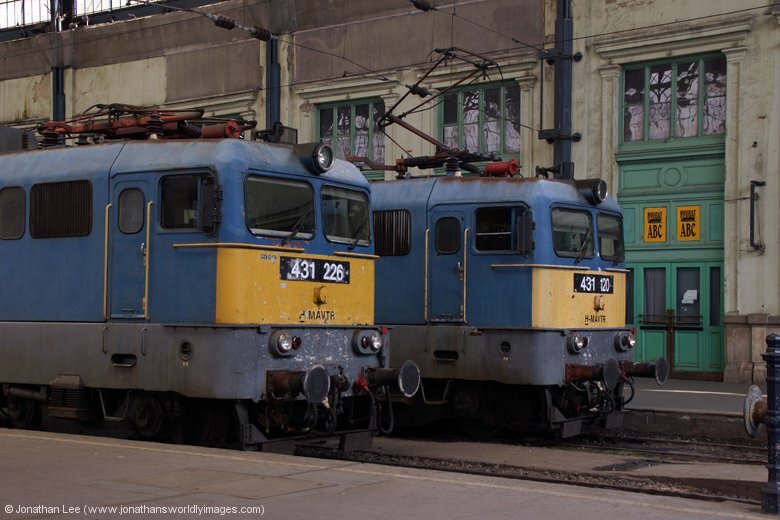 4 locos on the blocks, all in a similar colour to BR blue, the sun shining through the windows above and the whole ambiance of the place just giving a feel that it was in a different decade. I was suitably impressed. The hustle and bustle right outside the station doors gave a completely different perspective mind. 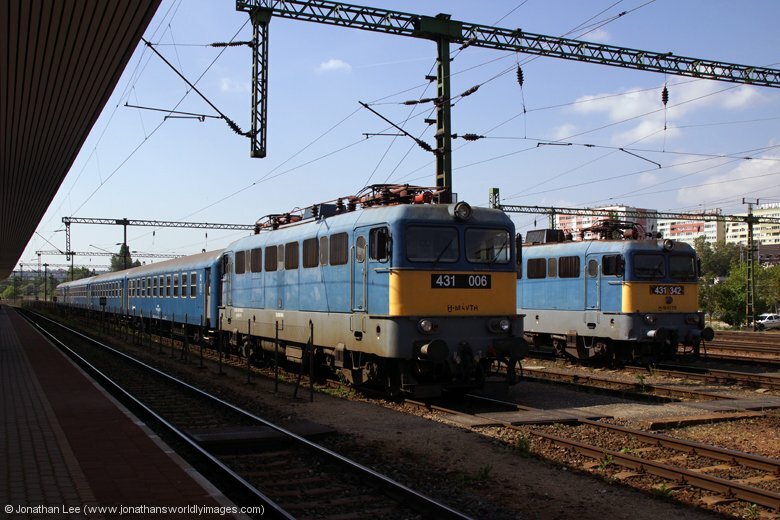 During the afternoon we spotted a ballast train at Kobanya Kispest with M61.020 a freight with DB 478001 and also MAV 431009 with 796 1605 Kobanya Kispest – Kelebia (usually starts Keleti but diverted due to engineering works at Keleti). 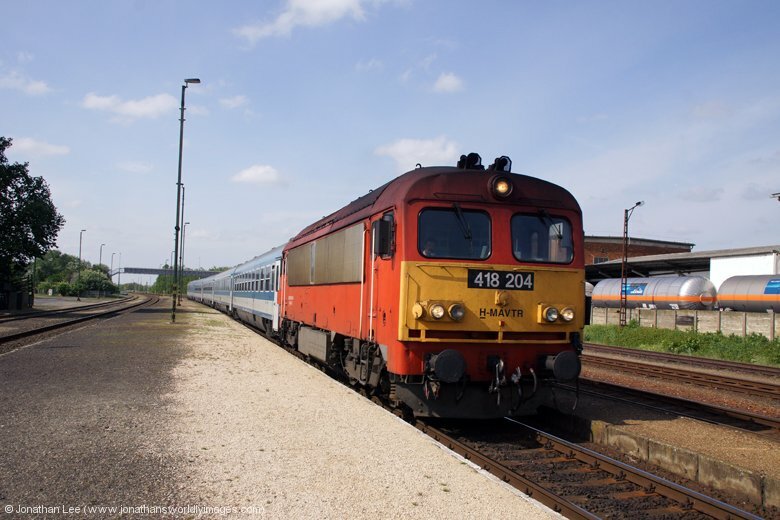 431009 was the oldest one we saw and at 1967 vintage and 47 years old it was a pleasure to see such locos still running around. By 1600 in the afternoon the novelty had worn off and locos had started to come back out of Nyugati that we’d had in. 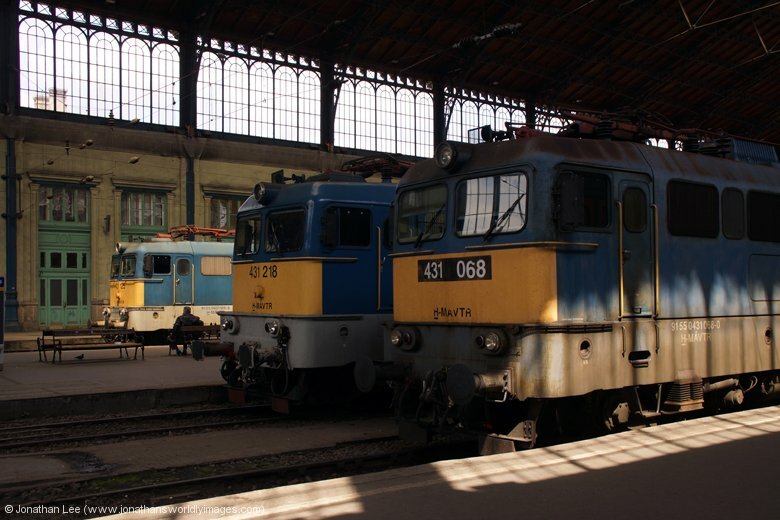 Coupled with the fact that we couldn’t predict what would do what on the locals with the EMU’s being dotted about we decided to call it a day upon arrival into Nyugati with 431062 on IC615 1332 Nyireghhaza – Budapest Nyugati and headed across to Keleti to make sure the engineering works didn’t hinder our overnights that night. We opted for the metro from Nyugati to Keleti, which isn’t signposted out of the station but it immediately out of the doors and turn right, and then down the stairs. 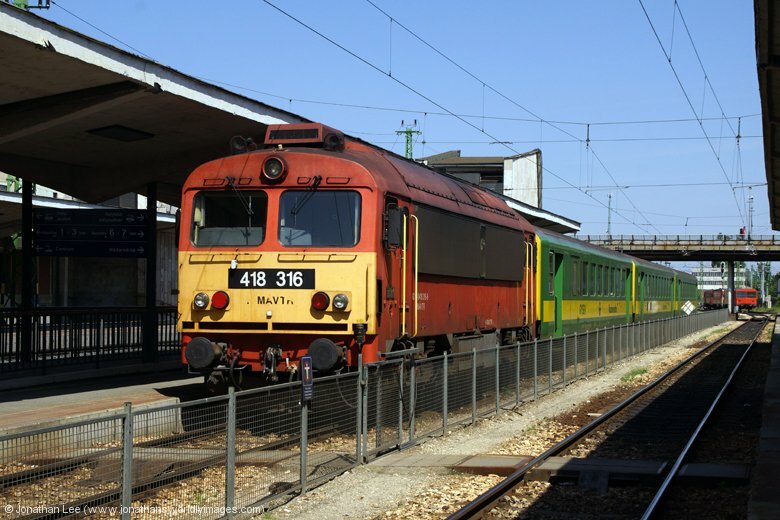 A single ticket costs HUF350 per person to get to Keleti and the journey involves a change at Deak Ferenc ter en-route; the whole journey only taking 12 minutes, including the change. We managed to confirm that our overnights, to Zurich for me & Munich for Aidy, weren’t affected by the engineering works. It then didn’t take us long to figure out from the arrival/departure screen what was running. 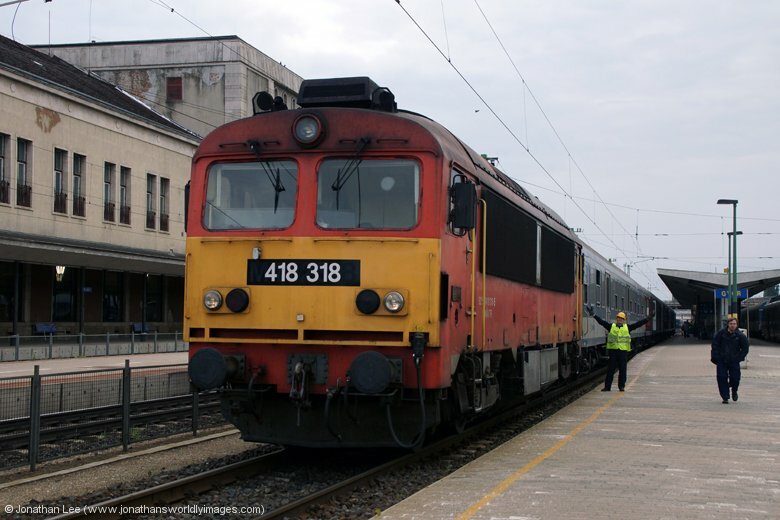 Having no gen for the locals ex Keleti we soon realised that the Keleti – Sulsap/Hatvan trains were MAV 432s and thanks to a late runner inbound we managed to do two quick returns to Kobanya Felso before making time for food, which ended up being at McDonalds over the road from Keleti. Food over Aidy and I parted company, he was off to do a few more spins before his Munich overnight, I headed over to platform 1 for my 1910 Euro Night to Zurich. When I got there I found the 1910 Euro Night to Bucharest! 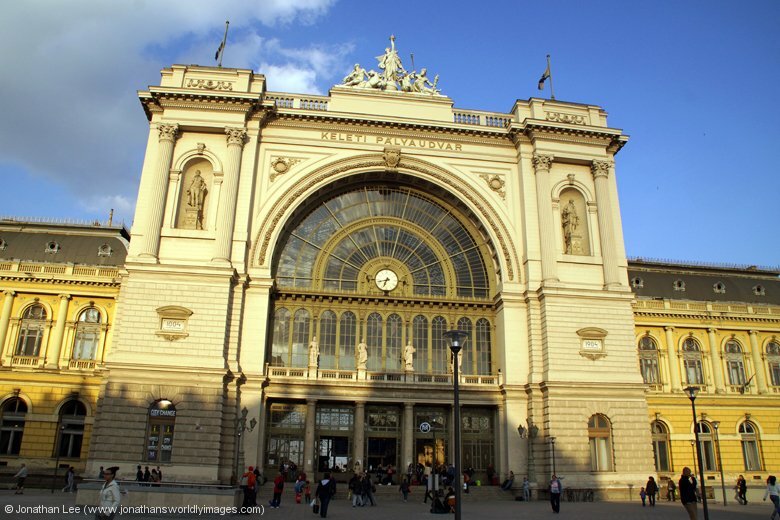 Had I paid more attention to the screens before rushing off I’d have saved myself a lot of walking round Budapest Keleti station! 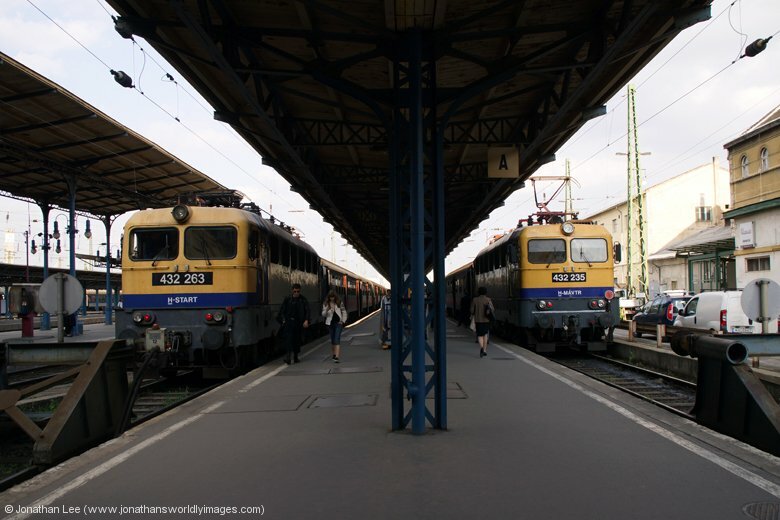 My train was actually in platform 9, both EN trains departing for Bucharest & Zurich at the same time. Platform 9 had been about 20 yards to my right at the time I should have paid more attention! 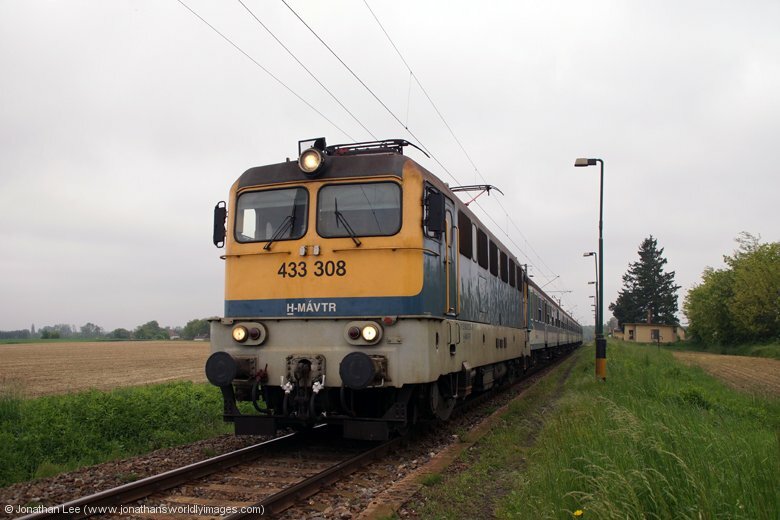 MAV470009 was at the head of the train and I was in the back coach in a two berth sleeper compartment. 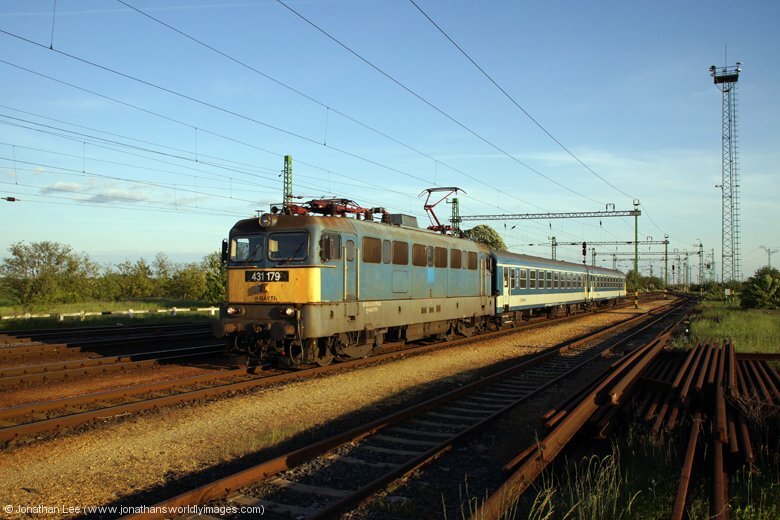 I was joined at Kelenfold by the compartment’s other occupant who wanted the upper berth as opposed to his lower berth; I wasn’t going to complain and spent the evening relaxing and recharging both my electrical goods and myself as we headed to Vienna. 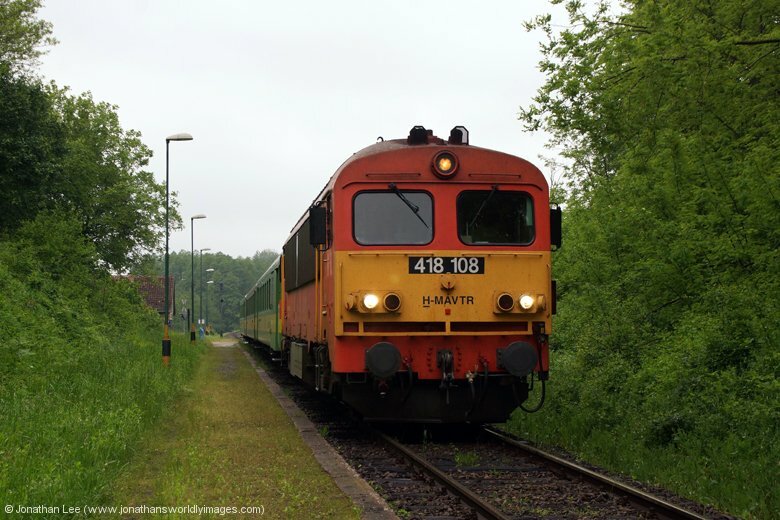 Upon arrival at Wein Westbahnhof 1116170 was attached to EN466 and the MAV day coaches detached nearest the blocks. 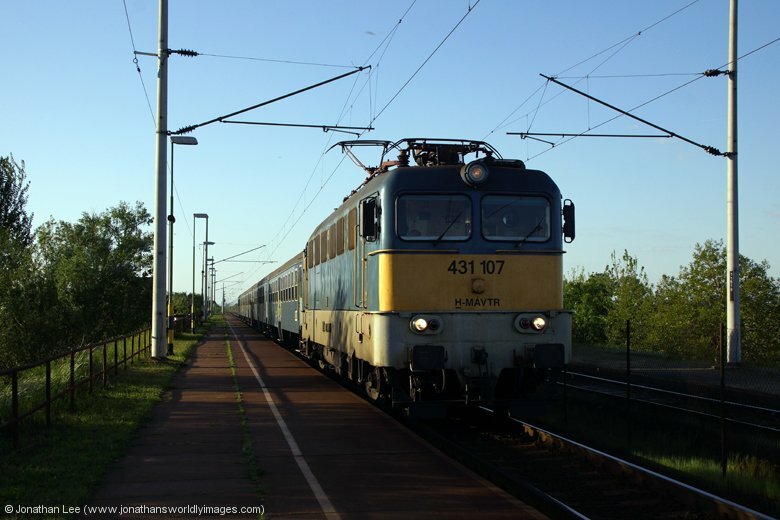 We were then shunted onto the OBB day coaches in another platform to make up the set going forward to Zurich as EN466. Unfortunately there was no gronk action for me, unlike some of the other trains in the station which were being shunted about by an OBB diesel shunter. Engine spotted I didn’t need to remain awake for any other reason and was in bed before we departed Wein.